U.S. 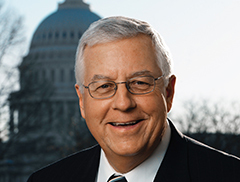 Senators Mike Enzi and John Barrasso, both R-Wyo., along with seven other senators, introduced legislation today that would permanently prevent the federal government from shutting down in the future, ensuring that essential government services are not disrupted and protecting taxpayers who must bear the resulting cost. The End Government Shutdowns Act would create an automatic continuing resolution (CR) for any regular appropriations bill or existing CR, keeping the federal government open when budget negotiations falter before key spending deadlines. The End Government Shutdowns Act would automatically continue funding for discretionary programs for which a budget has not been enacted by the Oct. 1 deadline each fiscal year. After the first 120 days past the Oct. 1 deadline, if the government has yet to enact spending bills, the budget for each program, project or activity affected would be reduced by 1 percent. The funding would again be reduced by 1 percent every 90 days thereafter until Congress does its job and completes the annual appropriations process. U.S. Senator Rob Portman, R-Ohio, has led the introduction of this legislation in every Congress since 2010. U.S. Senators Steve Daines, R-Mont., Chuck Grassley, R-Iowa, Mike Lee, R-Utah, Lisa Murkowski, R-Alaska, and Jim Risch, R-Idaho, also cosponsored this bill. The full text of the legislation can be found here. See our FCC public file here.